You'll be £25.00 closer to your next £10.00 credit when you purchase The Private Diaries of Alison Uttley. What's this? 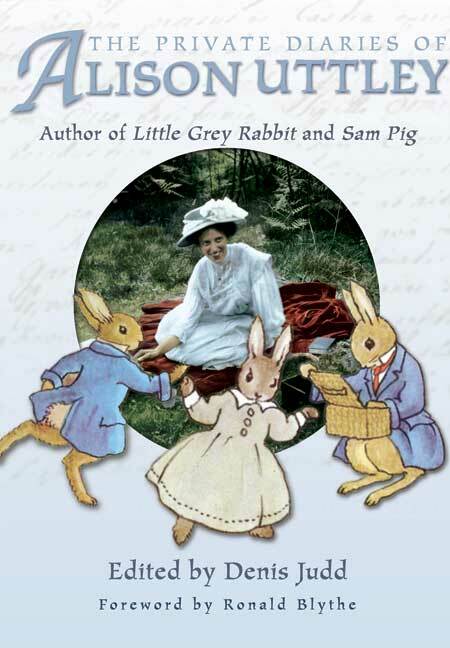 Popular children's author, Alison Uttley (Little Grey Rabbit and Sam Pig) spent over 40 years writing diaries. Professor Denis Judd, who knew Alison and has previously written her biography, reveals a different side to the writer whose husband committed suicide and whose close relationship with her son is recorded in detail. But the magic of the author rings through on every page as she writes about her daily life in Berkshire, the red-lipped 'fisherwife' near neighbour (better known as Enid Blyton!) and her tempestuous relationship with her illustrators. She also writes endearingly about the changing seasons, reflecting much of her adult writing. These beautifully written diaries have been skilfully edited by Denis Judd, one of the Trustees of her Estate and a renowned biographer in his own right. Wonderfully written with a truly nostalgic look at days long gone, this is a must-read not just for fans of the Alison Uttley work but for anyone who enjoys good writing. Meticulously edited by Professor Denis Judd [the Diaries] reveal further aspects of the author's complex character, including her tempestuous relationships with her illustrators and her dismissal of Enid Blyton as a 'red-lipped fishwife'. [The] private diaries - edited by Denis Judd - reveal a talented, but very complex, personality who had a stormy and tragic family life. In many ways it was lucky that the diaries actually survived Alison's death as her son John, with whom she had a love-hate relationship, almost ended up burning them. Uttley's diaries tell of success, tragedy and a frosty Enid Blyton...Professor Judd said there was initially some hesitation about publishing the diaries because of the tragedies Alison encountered in her life. She wrote about her dreams and her psychic abilities as well as expressing a deep love for her son John...She also describes in loving detail her fondly remembered childhood in rural Derbyshire. The release of the private diaries of the late Alison Uttley...has been causing a stir. The book reveals not merely the creative inner world of a gifted and productive writer...but also charts the highs and lows of her personal life, as well as providing a wonderful record of nearly forty years of British history. There are...vivid recollections...to be found in The Private Diaries of Alison Uttley which tell the story of the Thirties up to the Seventies through [her] eyes. It's a celebrity spat [with Enid Blyton] that could have come from the pages of the tabloids or rock 'n' roll folklore - but instead [Uttley's] newly published diaries reveal how two of the world's most celebrated children's writers don't see eye to eye. Uttley's writing for adults and children provided a direct, personal link, via 19th century rural life, to the pagan/magical world beyond. There are moments [in the Diaries] of peace and stillness, a sense of work done, tidiness, money in the bank, as Uttley evokes a lamplit room in the dark winter, an image that recalls her Derbyshire childhood. Denis Judd has succeeded in creating a single volume that gives a fascinating insight into the complicated mind of an acclaimed British writer...this book is compelling in its honesty. The book will fascinate anyone interested in this well-known author and serves as a social commentary on 40 years of social and economic upheaval...With Judd's editing, Uttley's diaries are a compelling read. [The Diary] will join the ranks of writer's confessions...It is eloquent and, of course, stylishly written. Anybody recalling the distinctive flavour of any of [Alison Uttley's books] will find their taste buds wonderfully whetted by this new volume...the Diaries are a fascinating chart of a writer's development. Everything she published is soaked in a sense of having sprung from the deepest part of a rich imagination. Thanks to Denis Judd's sympathetic editing...this other Uttley shines through. The Private Diaries of Alison Uttley reveal the author to have been a difficult controlling woman who despised many people including her neighbour Enid Blyton. Unquestionably gifted as a writer, her edited diaries bear witness to her prodigious literary output, her appreciation of nature lyrically described and her heart-warming nostalgia for her idyllic rural childhood...Dennis Judd [is] the heroic editor of these previously unpublished diaries. The Diaries are more Stephen King than Good Housekeeping...The opening entry...reads as though we have strayed into Dorothy Wordsworth's journals.